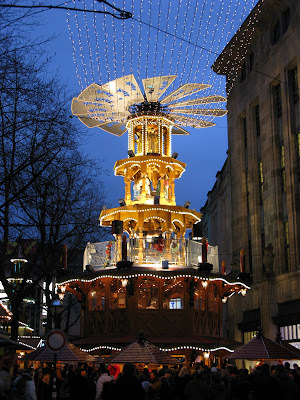 Germany is welcoming Christmas with its Christmas markets to be found in most cities. Traditionally you can buy handmade Christmas decorations and homely gifts. Most importantly it is the place where you can buy Glühwein (hot wine with spices...), Bratwurst or Reibekuchen. Photo From Karlsruhe, Germany, December 2008.